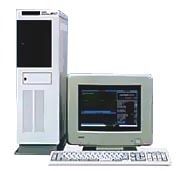 The OKI A10 series was comprised of Intel based computers holding either 80286 or 80386 CPU (model 10/30/50/60) or an 80486 (model 70). They ran MS-DOS and specific Office Automation software. All models supported TCP/IP and 10Base2 networks. They could be used as servers or work stations for the Oki A100 series of computers and network servers. see more OKI A 10 Ebay auctions !